Meissner will be presenting on the Conference Track, Stage 4, during the INTERPHEX New York event, which runs April 2 - 4, 2019, at The Javits Convention Center, New York, NY. Robert Davies, Global Product Manager, will deliver key insights and advances made to further the CryoVault™ Platform, which provides an end-to-end solution for the freeze and thaw of bulk drug substance (BDS). The CryoVault™ addresses the industry's previously unmet need for a large scale (> 20 L) freeze/thaw solution by delivering a robust, scalable, truly single-use option. The platform was designed to harmonize the components necessary for the freezing, storing, distributing and dispensing of critical high value biopharmaceutical fluids (e.g. BDS). 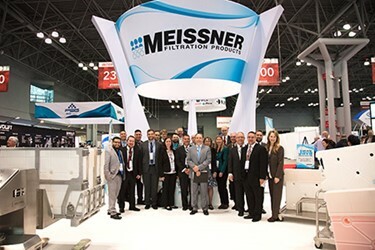 At the event, Meissner will host visitors in booth #2341, an 800 sq.ft. island configuration. Meissner will be displaying advances in filtration and One-Touch® single-use systems for fluid handling. Visitors will be invited to enjoy a cappuccino, latte or espresso at Meissner’s coffee bar, while learning about the latest product and technology advances. Meissner enables pharmaceutical and biopharmaceutical manufacturing by providing advanced process solutions that encompass a wide variety of filtration media available in an unparalleled range of form factors, innovative single-use systems, and an expanding portfolio of automation platforms. Our team of experts provides support throughout the lifecycle of our client’s process, from design engineering, to implementation and validation services, through logistics assistance. Meissner’s global customer base is serviced through a worldwide network of personnel. For more information, call +1.805.388.9911, or visit www.meissner.com.